A research team led by scientists at Provista Diagnostics has released data from a new study showing that a multiprotein biomarker blood test to detect breast cancer, Videssa® Breast, can help inform better decision-making after abnormal mammogram or other breast imaging results and potentially reduce the use of traditional biopsy by up to 67%. The new study evaluated the performance of the multiprotein biomarker liquid biopsy test among women under age 50. Participants were enrolled into two prospective trials that recruited 545 women, ages 25 to 50, with abnormal or difficult-to-interpret imaging (BI-RADS 3 and 4). The overall performance of the liquid biopsy in women with a breast cancer prevalence of 5.87% resulted in a sensitivity of 87.5%, specificity of 83.8%, positive predictive value (PPV) of 25.2%, and a negative predictive value (NPV) of 99.1%. 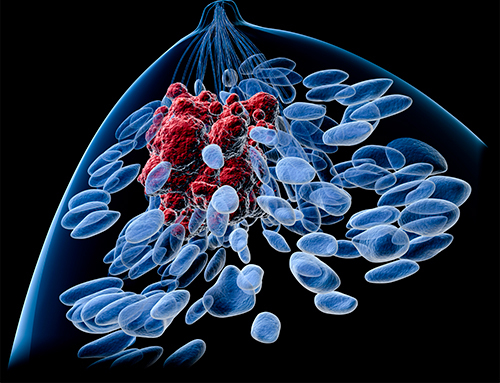 The study authors noted that the high NPV helps clinicians identify patients who are highly unlikely to have breast cancer. Depending on age, approximately 70% to 90% of breast biopsies are benign. The improved PPV of the technique over imaging—25.2% vs. 8.8%—can increase the percentage of biopsies that yield a breast cancer diagnosis from 1 in 11 to 1 in 4. The Videssa Breast assay has been employed in two prospective, randomized, multicenter, and blinded clinical trials, in more than 1350 patients ages 25 to 75. It is the first prospective study of a proteomic assay composed of serum protein biomarkers and tumor-associated autoantibodies being used to detect breast cancer in women with abnormal imaging results. The researchers have expressed optimism about future studies using the liquid biopsy technique.